The Religious Education Department was excited to have their program in the new Redeemer Activity Center auditorium! See the full story. Christ the Redeemer Catholic Church dedicated and blessed its new Redeemer Activity Center (RAC) Aug. 12 in Northwest Houston. Daniel Cardinal DiNardo celebrated Mass at Christ the Redeemer, and dedicated and blessed the new building. Parishioners ‘make their mark’ at the Beam Signing! All of our parishioners were invited to attend the Redeemer Activity Center (RAC) Beam Signing Party! The steel girding beams are all in place, so parishioners were able to sign their family name (and leave a Bible verse) on one of the many steel beams that will hold up the RAC. See the story. On May 7 we celebrated our Groundbreaking Ceremony for our new Redeemer Activity Center (RAC). Beginning in early May, renovations begin on the current Youth Ministry suite. The space will be transformed during the summer months into classrooms, and meeting and lab spaces for Christ the Redeemer Catholic School. In anticipation of the renovations, the Youth Ministry Office is now on the second floor of the Parish Office. Dear friends in Christ, By now all registered households of CtR should have received a letter from me updating you on the progress of our construction of the Parish Life Center and our One Faith, One Family Capital Campaign. Please allow me to expand upon that here. 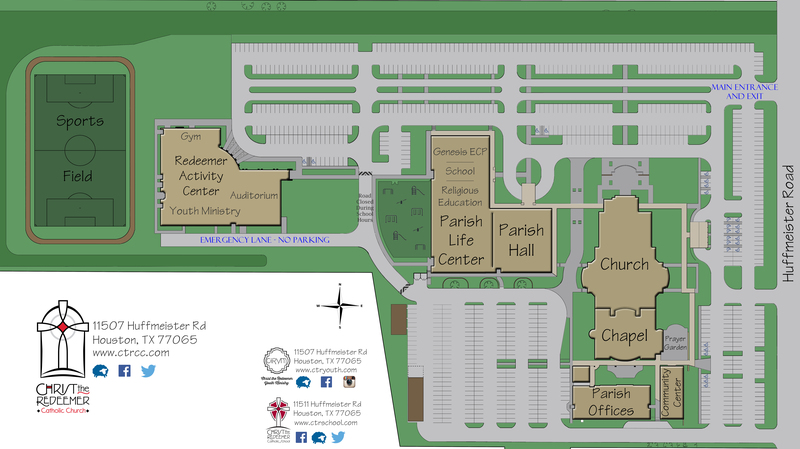 We are making great strides in the construction of our new Parish Life Center. The heavy rains of a few weeks ago didn’t throw us off schedule too much. The building is nearly 100 percent “dried in” now and work both inside and out continues at a good pace. It takes only a quick glance at our construction site to know that we are making great progress on the new Parish Life Center. The steel framing is being erected at a very rapid pace. We’ve made good progress the past few weeks, and we expect to hit a couple of major construction milestones next week during Spring Break. We have poured the first two sections of the new parking area and driveway, and in the process we have relocated the required retention ponds and ditches to the back portion of our property. In addition we have finished storm water and fire line underground water main tie-ins.